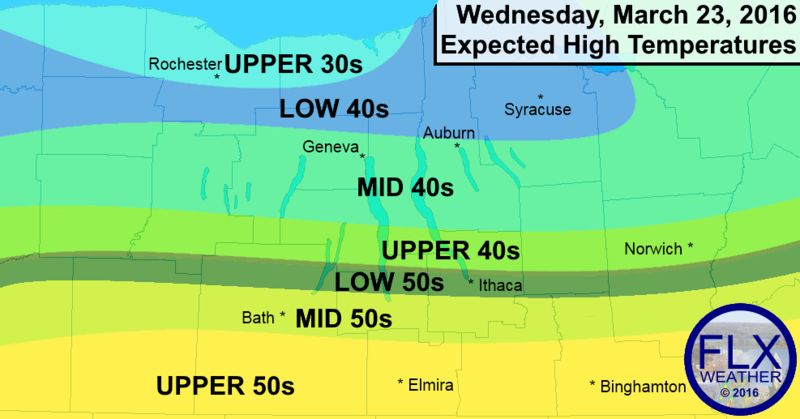 Temperatures will range from the upper 30s in Rochester to the upper 50s in Elmira on Wednesday. This vast difference in temperatures is thanks to a strengthening front that is draped from west to east across the Finger Lakes. As this front strengthens, areas near and north of the front will cool slightly this afternoon while areas to the south warm up. For most of the Finger Lakes, this will mean temperatures in the 40s for most of the day. Temperatures of 50 degrees or warmer are most likely from Ithaca, south. With this front in place, it should not be a surprise that rain showers will be moving back into the region this afternoon. The chances for rain will be highest near and north of I-90, but most of the area should see at least some on and off showers through the night and into Thursday morning. For the northwest corner of the Finger Lakes region- mostly from Canadaigua north and west, some of those showers could mix with snow tonight or even turn to freezing rain as temperatures fall to the lower 30s. Locally slick roads will be possible, so use caution traveling tonight and early in the morning. The rest of the region will only see rain showers, with temperatures throughout the lower levels of the atmosphere above freezing. Thursday morning, the front will start to lift north as southerly winds increase ahead of an approaching storm system. For much of the Finger Lakes, the showers will come to an end by the late morning and temperatures will soar into the low 60s. Areas around and west of Rochester again will be colder, with highs possibly sticking in the 40s. Rain will move back in Thursday night, possibly with some thunder, as the storm system moves in. Rain showers will continue into early Friday before tapering off later in the day. Temperatures will fall from morning highs in the 50s into the 40s. Saturday and Sunday both look pleasant with a mix of sun and clouds. Saturday will be near normal, with highs in the mid and upper 40s, but Easter Sunday will be very warm with mid 60s a good bet for much of the region. A windy rain storm will move in on Monday, with more unsettled weather to come as we close out March.